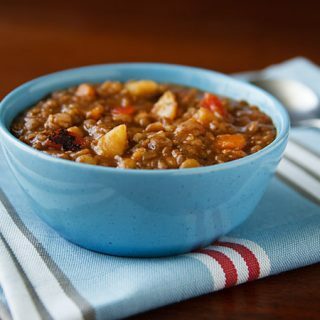 This quick and easy vegan lentil soup tastes like it’s cooked for hours, but with a pressure cooker, it can be on the table in about 30 minutes. Regular stovetop directions are included. May is the month when I generally give up on opening our screened windows and settle into the reality of air conditioning. While not as hot as the sauna that is June or the pressure cooker that is July and August, the end of May usually gives us Mississippians a good taste of the summer heat to come. But May can surprise us with some rare cool nights and sunny but mild days, which is what was going on this week, the last week of school for my daughter…and of freedom for me. Well, relative freedom. While trying to put as much time as I could into my own projects before I become Chief Chauffeur and All-Around Entertainment Coordinator for the summer, I’ve still needed to find time to make it to all of the end-of-the-year award ceremonies, performances, and gatherings that get crowded into the last days of school. On one hectic evening this week, I needed a meal on the table in about a half hour, so I decided to take advantage of the blissfully cool weather to make something I probably won’t want to make again for several months: lentil soup. With no time to chop vegetables, I decided to take advantage of one of my dirty little secret ingredients: frozen mirepoix blend vegetables. Mirepoix is simply a blend of chopped onions, carrots, and celery, and nothing could be easier to throw together, but prepping vegetables does take time. So when it goes on sale, I stock my freezer with this packaged mirepoix blend; it makes a great base for sauces, beans, and soups. Often I sauté it until lightly browned, but this time, I just threw it in with the lentils and let it all cook together. 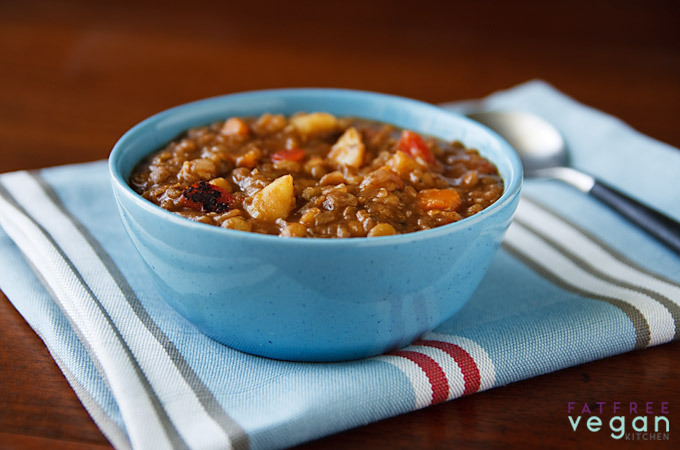 I finished the soup off with canned, crushed, fire-roasted tomatoes (which are saucier and take less time to cook than diced) and some hickory salt for a great smoky flavor that made this ridiculously easy lentil soup taste like it had cooked for hours. Instead of the frozen mirepoix vegetables, feel free to use 1 onion, 2 carrots, and 2 ribs celery, diced. 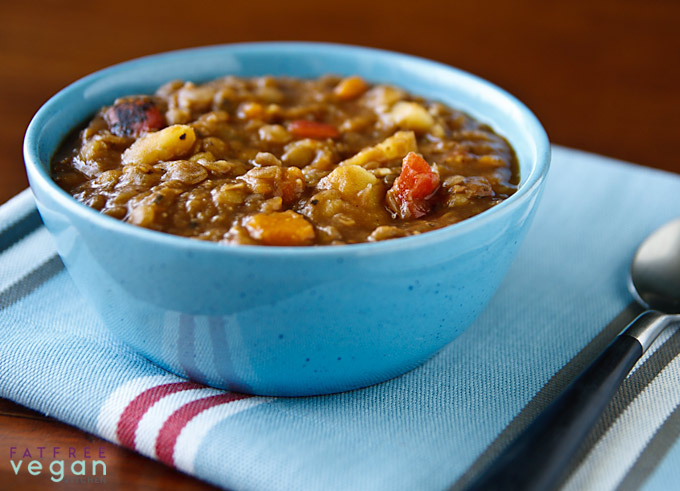 Place lentils, water, and next 8 ingredients (through garlic) into pressure cooker or large pot. For pressure cooking, seal the cooker and bring to high pressure. Cook under pressure for 10 minutes. Remove from heat and allow pressure to come down for 5 minutes. Then, release any remaining pressure and return to very low heat. Add tomatoes, pepper, and both salts, and taste to check seasonings. If necessary, add more to taste (I added more oregano and garlic). Cook uncovered for at least 15 minutes, adding more water if it seems too thick, and stirring from the bottom often. Stir in vinegar just before serving. For regular cooking, bring to a boil, stir well, cover pot, and cook over low heat until lentils are tender, about an hour. (Add additional water if it begins to dry out.) Add tomatoes, pepper, and both salts, and taste to check seasonings. If necessary, add more to taste (I added more oregano and garlic). Cook uncovered for at least 15 minutes, adding more water if it seems too thick, and stirring from the bottom often. Stir in vinegar just before serving. I made this yesterday and it was soooo good. It is definately going into my "make it a million times" pile of recipes. Didn't have any hickory salt so I put some smoked paprika in at the end and I probably put in twice as much garlic as the recipe says but its the kind of recipe you can play with depending on what you have on hand and will still end up fantastic. I may have already commented on this, but it's worth commenting again. This is one of my favorite recipes. It is super-fast and SUPER-delicious! I added cut-up faux-sausages from another recipe toward the end along with a little liquid smoke-yum! This is very yummy! Even my non-Vegan husband likes it. Your site has been a lifesaver for me, thank you! Has anyone tried it with fresh tomatoes? Will roasting the fresh tomatos i have on hand in my cast iron pan give a similar effect as fire roasted tomatoes? Yes, I mde a similar soup using the bumper crop of tomatoes from my garden. I 1/4ed them and placed them in the pan skin up, and put them under the broiler until the skin began to blister and char, peeled them and added them at the begining of the soup making process. It totally worked! Alow them to cook down in the soup. Transfer any liquid that remains in the pan to the soup as well. If you aren’t using any canned tomatoes you will need to add some other liquid to make up the difference. I used water. Good luck! I made this today for a health expo that we put on. I had to feed our volunteers so I put this in my crock pot last night. It was awesome and everyone loved it. I put everything in the pot last night and put it on high, then this morning I turned it to low to keep warm until we were ready to eat it. I used liquid smoke since I did not know where to get that salt. I also found a frozen mixture of potatoes, carrots, celery and pearl onions so it was so easy. Thank you so much for this recipe. I'm making this for dinner tonight. I keep snitching bites, it smells so delicious and tastes even better. This is one of my family's fave soups. I add 2 cups chopped kale or spinach for added nutrition. And I love how this soup is super easy! Just made this recipe this eve. Definitely so easy and so good! Thank you for sharing! We were short on time and big on appetite tonight and this soup/stew was just the ticket. Thanks for another great idea, Susan. I put half in the fridge for lunches tomorow and added chopped broccoli and a nice splash of Merlot into tonight’s dinner. Deelish. Made this recipe yesterday. Did not have can lentils and use white northern beans it was delicious. Also had good comments from my family. Thanks for the recipes. It was delicious! I added shiitake mushrooms, and for the broth I used Trader Joe’s Beet and Purple Carrot Juice. For the vinegar, I used balsamic. This is so easy and filling. Thank you, Susan. It was ridiculously easy and wonderfully delicious. 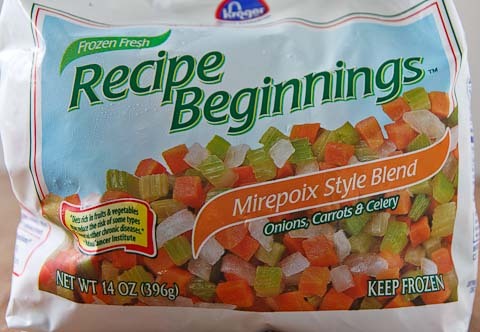 I even learned something new: I now know what mirepoix frozen vegetables are! I actually found them in our local store. Very good! I was reading some of the other comments and realized I forgot to add the vinegar. Oops! It was delicious! Yum! I am not surprised you miss your own cooking! Your recipes are great! I go to your site time and time again! ah I am in the middle of making this. Got it all cooking exept the salt and bouillon, but didn’t realize I have to cook it in two parts. Silly me. The lentils may NEVER soften, but I shall carry on and see if they might. Will report back. Oops, yeah the acid in the tomatoes may keep the lentils from softening quickly, but you never know–maybe you lucked out and have fresher lentils. Hope it doesn’t take very long! Is this with regular at-the-local-grocery lentils or the French Puy lentils? I’m sure it would be wonderful with either one! I just used regular lentils, but you’re right that Puy lentils would be excellent, too! I love to make a big pot of soup every weekend that my husband and I can enjoy throughout the work week. This is a fantastic recipe! So delicious and very easy to make. This will be a regular in our home – especially now that we’re feeling the first whispers of Fall in the air. Thank you! I made this yesterday for the first time and I was so happy that I finally found a lentil soup recipe that the whole family loves! Also, I am trying to lose weight, and this soup tasted so hearty and satisfying while still being low in calories. Since I am counting my calories I wonder if it was at all possible to include the serving size in grams in the nutritional info of the recipes. That way, it would be even easier to measure the portion quickly be it for eating right away or for freezing. I realize this is rarely included, but I just thought it won’t hurt to ask and it would make my life so much easier. This is not the first recipe I have tried on this site and everything has been delicious! Thank you!! 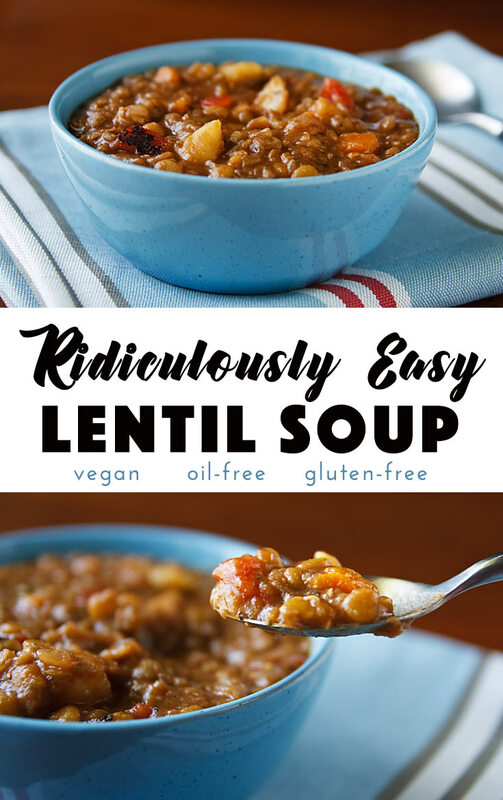 Definitely my “go to” lentil soup recipe! as far as nutritional value, is one serving one cup? No, it’s hard to say how many cups a serving will be because how you cook it (pressure cooker or stovetop, high heat or low, etc.) will change how much liquid evaporates. Looking at the recipe, a serving will probably be somewhere between 1 1/2 to 2 cups, but the only way to know for sure is to make a pot and divide it into 8 equal servings. Hello this looks great I just got a couple questions whats the serving size for one person and were do u get 1.1 grms fat per serving and also are potatoes fatting?? Thank u are potatoes fatting?? 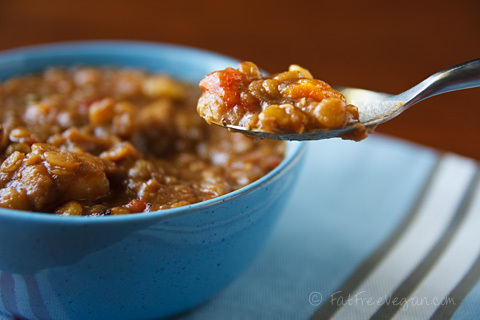 This is still easily my favorite lentil soup recipe! I didn’t think it would make enough difference in this recipe, so to save a step and keep it Ridiculously Easy, I didn’t pre-cook the Mirepoix. Also, frozen Mirepoix is pretty watery when you try to sauté it, so it would take a while to begin to brown. But you can, of course, sauté it if you want. I made the recipe Ridiculously Easy Lentil Soup yesterday. I felt that 400 g of lentils was way too much. So I only used around 250 g. I did like the soup very much. I really like the fact that it has a lot of fiber. I will make this recipe again.